a much easier upcoming Big South schedule. The Flames have had quite an eventful three weeks since playing West Virginia in Morgantown. Immediately following the loss to the Mountaineers, Liberty played arguably one of the biggest games in program history Sept. 19 in front of a record-setting crowd of 22,551. No. 15 Liberty played No. 8 Montana in the first ever top-15 matchup in Williams Stadium history. Liberty jumped out to an early lead and never relinquished it as they beat the Grizzlies 31-21. The game was monumental for the Flames as they proved that they could win the big one. After a big week at home, the Flames took off for their first of four straight road games. The Flames came into the game No. 10 against the unranked Southern Illinois Salukis. The Salukis scored 20 points before the Flames ever got on the board and the Flames never truly got back into it. 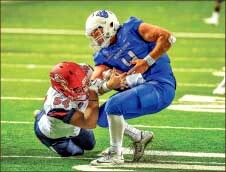 The Flames were troubled by costly mistakes as quarterback Josh Woodrum had two fumbles and placekicker John Lunsford missed two field goals, making that six misses on the season. The Flames also had two failed fourth-down conversions. rushing touchdown, more than any other back on the team at the time. The Flames eventually lost the game 34-13. Liberty had to shake-off the loss quickly as they went on the road to Georgia State the next week. The Flames entered their second FBS game of the season with a .500 record and not wanting to fall below that mark for the first time of the season. The Flames had dropped to No. 18 after their loss on the road the previous week. The contest was a back and forth one that saw the Flames surpass 500 yards offensively while possessing the ball almost three quarters of the game. Despite these numbers, the Flames did not put the game away until the Panthers last drive of the game with less than two minutes to play, when Flames redshirt-freshman defensive-back Chris Turner picked off Georgia State quarterback Nick Arbuckle. The final score was 41-33 in favor of the Flames. Redshirt-senior Desmond Rice’s three touchdowns and 87 yards rushing earned him Big South offensive player of the week honors. Macon added two more touchdowns to pace the Liberty backs this season with four rushing touchdowns on the road. Lunsford had his best game of the season, going 2-2, including a 56-yarder with 2:27 to play in the game. While Lunsford’s season and career numbers are below average compared to the rest of the NCAA, he continues to impress with his abnormally strong leg. The Flames first Big South matchup of the season will be on the road in North Carolina against the Gardner-Webb Runnin’ Bulldogs for their homecoming game. Gardner-Webb enters the game with a 1-3 record. The team’s only victory came over Virginia Union, a Division II team. The Flames look to prove that they can win the games they are supposed to win and not falter on the road against inferior FCS teams. The Flames will kick-off in Boiling Springs at 7 pm, Oct. 10.